Security consists above all, in providing an environnment in which consumers feel confortable to transact. Different payment instruments pose different security risks. Those associated with cash include loss, theft and counterfeit while risks associated with alternative payments are far more diverse and complex. They include card theft, card skimming, card-not-present fraud, identity theft, account takeover, fraudulent transactions, data breaches and more. As a result, it is difficult to accurately compare the risks associated with cash with those of non-cash payments, but nonetheless it is worthwhile to assess the scope of the problem. According to the European Central Bank, the total value of fraudulent transactions involving cards issued within SEPA (the Single Euro Payments Area comprising the 28 Member States of the European Union, as well as Iceland, Norway, Liechtenstein, Switzerland, Monaco and San Marino) amounted to €1.33 billion in 2012. This represented an increase of 14.8% from 20111 and amounts to €2.58 per person. In the US, the LexisNexis 2014 True Cost of Fraud Study2 concluded that merchants lost a significantly higher percentage of revenue to payment fraud than in 2013 (0.68% versus 0.51%). The increase was due to a higher volume of successful fraudulent transactions: the average merchant suffered 133 successful fraudulent transactions per month in 2014, 46% more than in 2013. In the fiscal year 2013, the US Secret Service recovered approximately $156 million in counterfeit US currency3 out of a total circulation exceeding 16 billion notes; in value, this represents less than €35 million. In India, the number of counterfeit notes detected by commercial banks and the reserve bank reached 488,273 for the fiscal year 2013-2014 compared to a total circulation of over 77 billion notes[footnotes url=”http://rbi.org.in/scripts/AnnualReportPublications.aspx?Id=1126″ title=”Reserve Bank of India Annual Report 2013-2014″ /]. There are also key differences between cash and non-cash risks. Firstly, in the case of cash, individuals and merchants can adopt straightforward measures to reduce risks. The most obvious are to reduce the value of cash stored, deposit it in a bank account or keep it in a safe. The security measures for electronic payments are far more complex and often depend on external providers. Furthermore, merchants are incurring increasing costs to combat payment fraud. In the 2015 Europol report, Exploring Tomorrow’s Organised Crime4, the law enforcement agency classifies currency counterfeiting as a declining criminal activity whereas cybercrime, which includes payment fraud, is the fastest-growing activity. Secondly, in the event of cash losses, the liability lies with the user, but for non-cash losses it is largely collective. If someone loses their wallet, they are accountable for the coins and banknotes lost. But if one or several cards are in that wallet, in the majority of cases, they will not be liable for the fraudulent use of those cards. Those costs are borne by the issuers and are included in their cost base. In other words, those costs are actually borne collectively by the community of card users. Thirdly, in the case of cash, potential losses are limited to the value of cash involved. But in the case of electronic payment fraud, the consequences can be much worse and sometimes dramatic, for instance, in cases of identity theft and data breaches (see page 29). In one notorious case of identity theft, the criminal, a convicted felon, not only incurred more than $100,000 of credit card debt, obtained a federal home loan, and bought homes, motorcycles, and handguns in the victim’s name, but called his victim to taunt him – saying that he could continue to pose as the victim for as long as he wanted because identity theft was not a federal crime at that time –­ before filing for bankruptcy, also in the victim’s name. While the victim and his wife spent more than four years and more than $15,000 of their own money to restore their credit and reputation, the criminal served a brief sentence for making a false statement to procure a firearm, but made no restitution to the victims for the harm he had caused. This case, and others like it, prompted Congress in 1998 to create a new federal offence of identity theft. Security consists, above all, in providing an environment in which consumers feel comfortable to transact. There is evidence that consumers are increasingly apprehensive of payment card fraud and associated threats including identity fraud. The IT vendor Unisys has developed an index to measure public perception of safety and security globally6. In 2014, the index showed that the top two concerns are identity theft and bank-card fraud, ahead of national security in relation to war and terrorism. In this context, cash offers a way to protect personal identity. According to a survey7 conducted by GfK in the US in October 2014, following high-profile security breaches at major retailers, 66% of consumers are concerned that their information will be stolen, and 61% of 18 to 24-year-olds are more likely to use cash compared to only 49% of those 65 and older. In modern society, people need to pay for their most basic needs including food, water and shelter. Cash is the only payment instrument which is issued in the best interests of society by a public authority. Confidence: the public should have a high level of trust in its banknotes. In 1943, American psychologist Abraham Harold Maslow published A Theory of Human Motivation8 and developed his theory on the hierarchy of needs. It is often represented as a pyramid with the most basic needs at the bottom and other needs as successive layers, with “self-actualisation” at the top. As each need is satisfied, the desire grows to achieve the next. Cash is issued by central banks. The objectives of the central bank in terms of cash supply are based on security quality, efficiency and confidence. In Maslow’s view, the first level comprises the physiological needs, which are essential to human behaviour: air, water and food. In modern society, with 54% of the global population living in cities, most people need to pay to obtain food and water. Accordingly, payment has become a basic need. Some non-cash payments aim to fulfil higher needs; in particular, many premium payment cards clearly aim to provide self-esteem, status and recognition. Marketing experts will probably argue that the most profitable products are those which satisfy the higher needs. However, in modern society, payments are required to cover the most basic needs. Cash generates revenue for the central bank and ultimately the state in the form of seigniorage. The word derives from the old French word seigneuriage, which refers to the right of the lord to mint money9 and consists in the net revenue derived from the issuing of banknotes and coins. Banknotes are a non-interest bearing asset. But when they are issued, they are recorded as a liability on the central banks’ balance sheet and invested in interest-bearing assets. Seigniorage is the difference between the interest earned and the costs of producing and distributing banknotes. For coins, the process differs as these are not redeemed by the issuing authority. Consequently, the seigniorage is the difference between the face value and the cost of production and is generated at the time of sale. 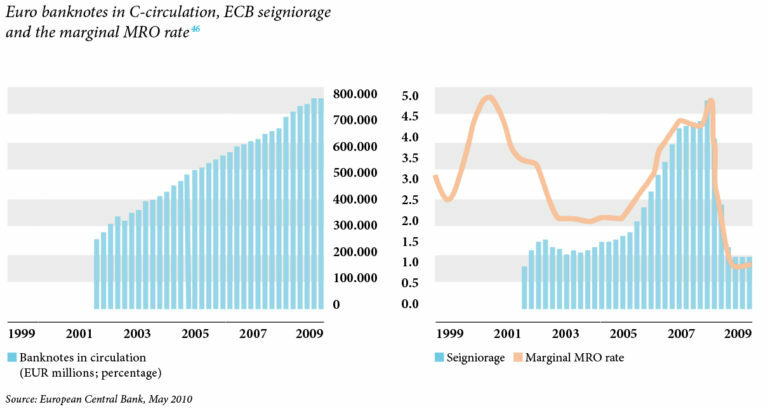 Seigniorage is a source of income for the central bank and consequently the state. Simply put, seigniorage is an income source for the central bank and consequently the government. It is sometimes viewed as a tax. In the case of the euro, the applicable interest rate is the marginal rate for the Eurosystem’s main refinancing operations (MRO). This rate has varied considerably over the past decade as illustrated below. It is also worth noting that currencies held by non-residents also generate income. Cash is a real-time payment instrument. It does not involve payment risk or credit risk. When a banknote or coin is handed over by a customer in a store, there is an instantaneous settlement of that transaction. The merchant becomes the owner of the funds and can use them immediately, e.g. to give change to the next customer or pay an employee. The merchant incurs no payment risk and no credit risk. If the same transaction is settled using a non-cash payment system, the settlement can take up to several months. While large merchants may receive settlement the following day, small or mid-sized stores receive the funds 2 or 3 days later. Some merchants, considered by card processors and acquirers as risky, may receive the funds in batches, as much as several months later. The banking community is clearly aware of the opportunities in accelerating the settlement of transactions. Global payments technology provider Clear2Pay has undertaken a comprehensive review of faster payments initiatives across the world11. When a banknote or coin is handed over by a customer in a store, there is an instantaneous settlement of that transaction. It defines a faster payment as a “domestic, inter-bank (i.e. not alternative payment schemes), purely electronic payment system in which irrevocable funds are transferred from one bank account to another and where confirmation back to the originator and receiver of the payment is available in one minute or less.” In other words, these initiatives are undeniably faster than “traditional” card payments, but in most cases are not real-time, unlike cash transactions. Transaction volumes for these initiatives remain relatively low; the Japanese fast payment system Zengin, which was the first to be established in 1973, processes 6 million transactions per day for a total population of 127 million. For retailers, the delay in the settlement of the transaction presents two challenges. Firstly, they bear the payment risk as long as they have not received the funds. Secondly, they do not earn interest on the funds until they reach their account. Cash is a critical infrastructure and plays an essential role in emergencies. The cash cycle has demonstrated its robustness and resilience in times of natural and man-made disasters. In October 2014, US President Obama’s credit card was declined at a restaurant as he was dining with his wife12. Luckily for the restaurant, the First Lady picked up the cheque. Payment transactions are denied for a number of reasons, as many cardholders have discovered: the card limit may have been reached; suspicious transactions have been detected and the issuer may have blocked the card; the card has expired; the magnetic stripe may have been demagnetised or the chip damaged; the retailer’s equipment may be out of service or simply out of paper; the telecoms network might be having problems, etc. There are also transactions for which some or all cards are not accepted. As a result, cash is very often perceived as a fall-back solution when other payment options fail. The research paper Consumer Cash Usage: A Cross-Country Comparison with Payment Diary Survey Data13 measured consumers’ use of cash in Canada, Australia, Austria, France, Germany, the Netherlands and the US between 2009 and 2012. The report estimates that average cash balances vary from $51 in the Netherlands to $148 in Austria and this difference is essentially due to the greater use of cash in one country than another. These balances vary from 1.5 times the daily consumer expenditure in Australia to 4.8 times in Austria. This reflects the importance of precautionary holdings as consumers carry far more cash than they actually require. Card issuers also recognise the fundamental role of cash as a fall-back solution, as most cards provide for emergency cash advances. Cash also plays a key contingency role for national payments systems in case of natural disasters or financial crises. The cash cycle demonstrated its resilience in natural disasters such as Hurricane Katrina in 2005, the 2011 earthquake and tsunami in Japan, and Typhoon Bopha which hit the Philippines in 2012. Unsurprisingly, the US FEMA – Federal Emergency Management Agency – now recommends to include cash in an emergency supply kit14. Cash also plays a role in the event of technology failures. In 1999, as the millennium approached, demand for banknotes increased significantly as consumers feared bank information systems could be affected by the Y2K computer bug. For many experts, including the World Bank, the impact of weather-related events will likely increase in the future under the combined pressure of global warming and the expansion of many cities in hazard-prone areas15. 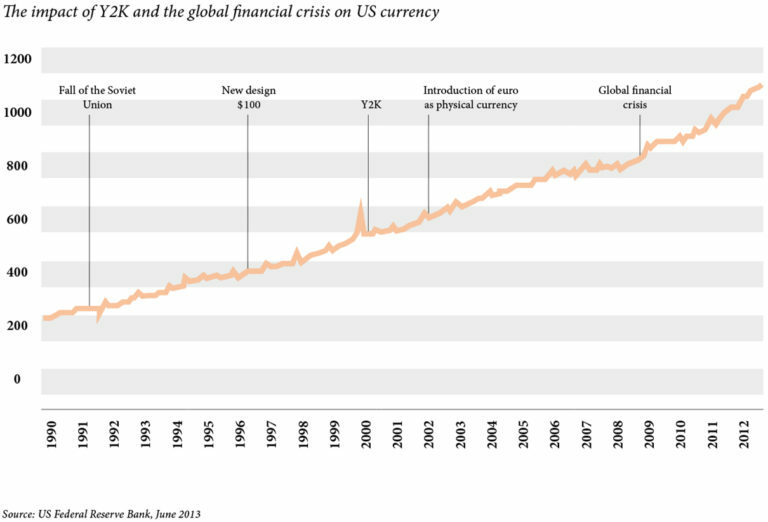 More recently, the collapse of Lehman Brothers and the ensuing global financial crisis also led to a significant increase in demand for currency. In Australia, the Reserve Bank estimates that demand for currency increased by AUD 5 billion or 12% in late 200816 although, unlike in many countries, the solvency of Australian banks was not in jeopardy. The Reserve Bank believes the rise was essentially due to an increase in precautionary holdings. The euro zone also registered a strong increase in the number of notes in circulation in the first half of October 2008, equivalent to a value of €35-40 billion17. According to Dario Negueruela, Chief Cashier of the Banco de Espana18, “Central banks, particularly after the ordeal of the crisis, have an important responsibility today as key managers in crisis situations. It is no longer sufficient to say that they are doing their work well; rather the important thing is to be in a position to respond to emergency situations and to anticipate unforeseeable events or exceptional demands.” Quality management and cost savings are no longer enough. Business continuity exercises study the systems that enable an institution or company to continue to perform its activities when an unexpected event occurs that affects the institution itself. Cash provides an area of freedom, where people can transact and protect their privacy. In a society where big data is leading to the increasing monetisation of personal information, anonymity is becoming scarcer and more valuable. Anonymity is a specific attribute of cash. Cash does not require the disclosure of personal information between both parties involved in a transaction. This feature has been the subject of a continued debate between those who urge for complete traceability of transactions and the advocates of privacy. For economist Kenneth Rogoff, “paper currency facilitates making transactions anonymous, helping to conceal activities from the government in a way that might help agents avoid laws, regulations and taxes.”19 This is evidenced, he claims, by the fact that outstanding currency significantly exceeds transaction needs both in the US or the euro-zone. Yes, banknotes are used by tax evaders and criminals, just as they are used by billions of people all over the world for perfectly legitimate transactions. The reduction of cash in circulation, or even its elimination, would have no impact on crime and tax evasion. Kari Takala21 of the Central Bank of Finland states that the abolition of cash would not stop tax evasion. He estimates that the use of cash in Finland in 2014, represented €18 billion whereas the grey economy amounts to approximately €2 billion. Therefore, assuming it is exclusively cash-based, the grey economy accounts for 10% of cash in circulation, at the most. Yes, cash enables two parties to carry out a transaction without revealing their identities. But this anonymity is limited by several factors. Regulations restrict the use of cash. A number of countries have imposed caps on cash transactions as illustrated in the chart on page 21. Some countries also prohibit certain types of transactions to be carried out in cash; in France, salaries above €1,500 cannot be paid in cash22. At an international level, the Financial Action Task Force (FATF) recommendations require that countries detect the physical cross-border transportation of currency through a declaration system23. Technology also limits the anonymity of cash. Serial number tracking solutions provide law enforcement agencies with tools to trace banknotes that have been connected to criminal activity. Forensic taggants with unique chemical signatures are used to protect cash; in the event of a robbery, the stolen notes can be traced to the crime24. The physical bulk of currency is also a limit to its anonymity. A million dollars in $100 notes weighs approximately 10kg. Yes, cash offers a space of anonymity. And in a society where cybercrime is on the rise, where, social media are transforming consumers’ perception of privacy, where big data is leading to the monetisation of consumer information, the anonymity space is becoming smaller and smaller. In this context, cash is the last frontier for anonymous but controlled transactions. A regulated anonymous payment instrument is essential. Firstly, because some degree of anonymity is perfectly legitimate. Secondly, in the absence of a regulated instrument, there is a risk that consumers could opt for unregulated ones. Lastly, the absence of anonymity could lead consumers to abandon some transactions. The brand consultancy Method conducted an experiment to discover what would happen when people’s private spending habits become public. The participants were challenged to log every purchase using an Instagram picture. It became clear that there was a significant grey area not covered by the Instagram feed, constituting all the purchases that the customers deemed uncomfortable or inappropriate29. Where social media is transforming consumers’ perception of privacy, where big data is leading to the monetisation of consumer information, the space for anonymity is becoming smaller and smaller. In this context, cash is the last frontier for anonymous but regulated transactions.